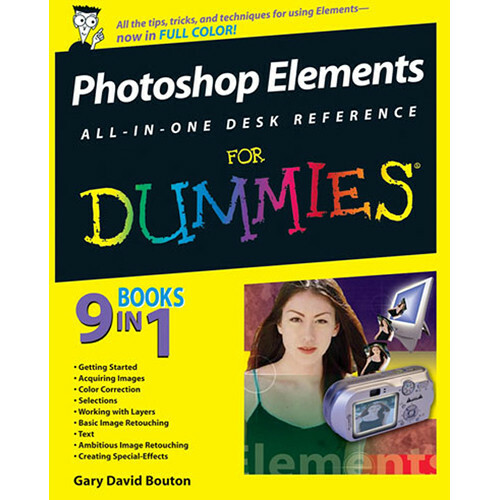 Photoshop Elements All-in-One Desk Reference For Dummies - These ten minibooks fill over 650 pages and give Photoshop Elements users the know-how, techniques, tips, and tricks they need to achieve professional-level results. Shows step by step how to navigate the Elements workspace, correct color and exposure, work with selections, fix defects, enhance photos with special effects, add text to images, and prepare images for printing or the Web. The Minibooks cover getting started, acquiring images, color correction, selections, working with layers, basic image retouching, text, ambitious image retouching, special effects images, and output. Propelled by the mass adoption of digital photography technologies and equipment, Photoshop Elements has become the leading intermediate-level image-editing software.